I was surprised how small the box was when the order arrived and there was another even smaller box inside but this is not a criticism, just not what I had expected. The books are lighter and more comfortable to hold as a result and they are also beautifully made. I am nearly through the first book and am enjoying the series so far. All perfect. The only unconvenient thing for me is that the letters are small and the text is condenced. Hard to read for a long time. The soft covers make these books simply luxurious to hold. 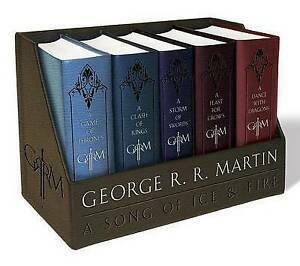 Ive already read A Song of Ice and Fire series and its amazing such a compelling story. I bought these purely for the aesthetic look to them and was not dissapointed they look amazing. Brilliant book im on the 3rd so far. Only down side is that the cover is much softer than expected so not as sturdy as youd imagine, the covers are also a different colour to the picture but if your not fussy and only want them to read it isnt an issue. They are also smaller than a normal book but doesnt effect the size of writing too much. As i said they dont seem very sturdy but i put mine through its paces and it hasnt fallen apart and still in the same condotion as when bought. Would definatly reccomend these books.